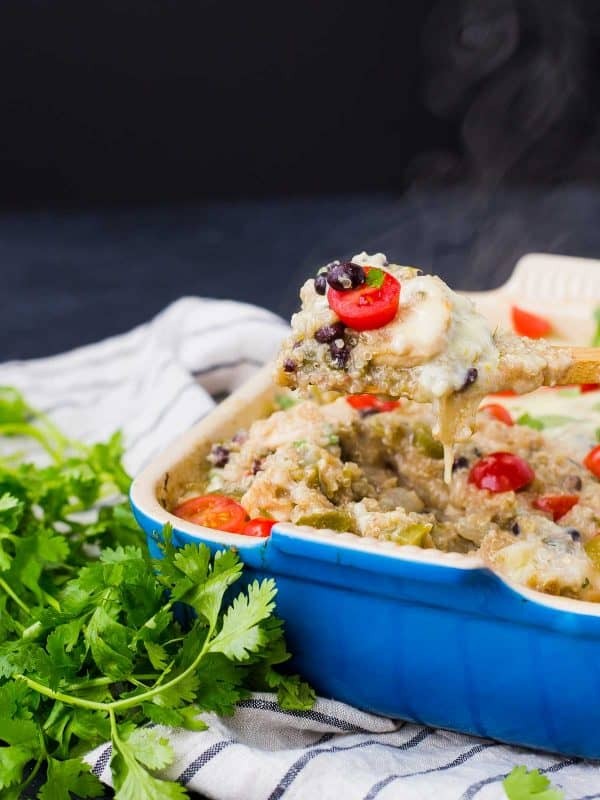 Easy to make in one pan, this green chile chicken quinoa casserole is a healthy, filling, and flavorful meal that everyone will love. 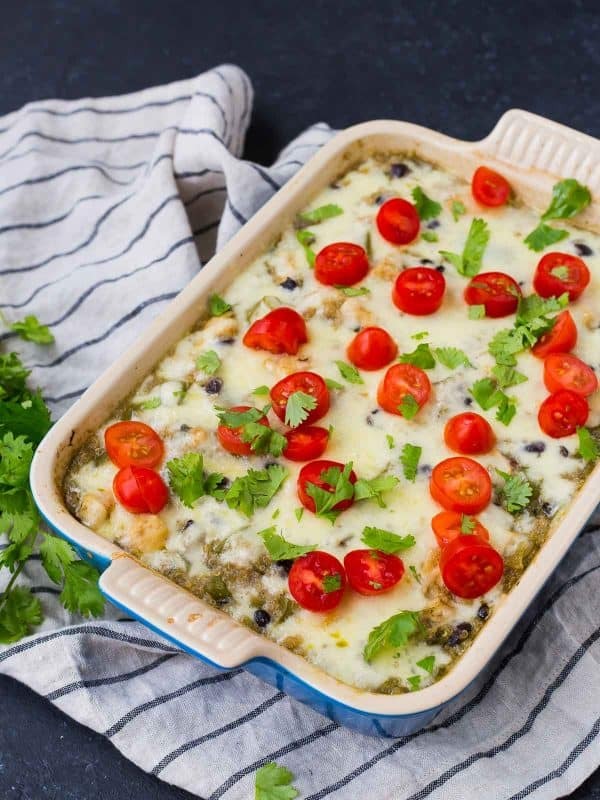 All the flavor of enchiladas verde in a healthy, easy to make one pan meal? It sounds like a dream, but it’s true! Simplifying life is something everyone needs. You have young kids? You know you need a simple meal. You have teenagers? I know you’re busy driving them places and dealing with attitudes. Career keeping you busy? You’ll need an easy meal that will keep you full for hours. No matter the reason, we could all benefit from a healthy, easy to prepare meal. 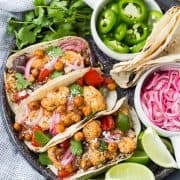 If that sounds like your life, you’ll also want to check out this one pan taco pasta that comes together in 30 minutes! For this simple recipe, literally the only thing you have to do is mix everything together in your baking dish. Your oven does all the work, baking the quinoa and chicken at the same time. The flavors of the Old El Paso enchilada sauce and green chiles along with warm cumin seep into the ingredients as they cook, making this incredibly flavorful, warming you from the inside out. PS: Use a baking dish that’s big enough. Don’t be me. I wanted to use the blue dish. It’s so pretty! And too small. Luckily, I saw the error of my ways and the way things were headed and put it on top of a foil lined baking sheet to catch any overflow, which of course happened. You’ll want to use at least a 9×13 pan. Love green chiles as much as I do? Preheat oven to 375 degrees Fahrenheit. Spray a 9×13 (or larger) baking dish with nonstick cooking spray (I used avocado oil spray). 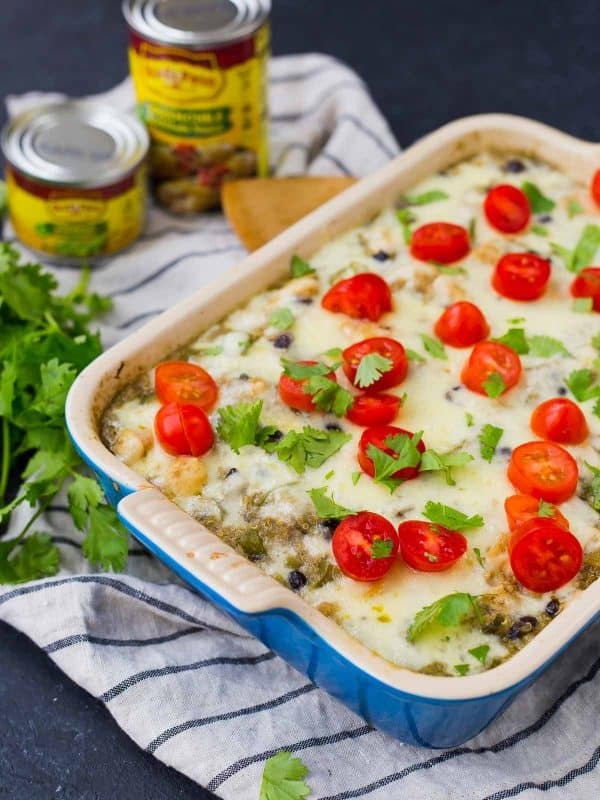 Combine all ingredients except cheese and toppings in prepared baking dish. Stir to combine. Cover tightly with foil and bake for 45 minutes. Uncover, stir, and recover tightly. Continue to bake for another 45 minutes to 1 hour or until quinoa is fluffy and chicken is cooked through. Uncover and sprinkle with cheese and bake for five minutes or until cheese is melted. Note: If you want to add some color to this, feel free to use red bell peppers instead of green! Note: This is great leftover, so it’s perfect for meal prepping to get ready for the week. Verdict: I loved the flavors in this quinoa casserole. It’s cozy and comforting but still healthy and so filling. Husband’s take: He loved this and took leftovers in his lunch. Changes I would make: None are necessary but make sure to have fun with your favorite toppings! Disclosure: I’m excited to partner with Old El Paso this year to bring you fresh and flavorful recipes like this quinoa casserole. Thank you for supporting Rachel Cooks by reading about brands we love and use in our own home. is this chicken raw or cooked? Raw! 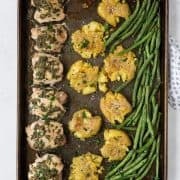 It all cooks together – it’s the beauty of this easy recipe! I hope you love it! I haven’t tried it with shredded cooked chicken, but the quinoa will still take some time to cook. I’d check it at 30 minutes and see how it’s doing…and then keep cooking if the quinoa isn’t fully cooked. 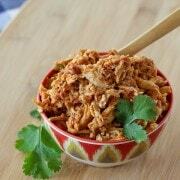 Looks like the perfect easy & delicious weeknight dinner! This looks so delicious! I love quinoa! Thank you! I hope you try it and love it! 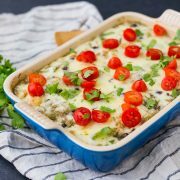 Hi, does the 1/2 cup chopped cilantro go into the casserole or is it only for the topping? All goes in! If you want to save some for topping, feel free! Looks delicious Rachel! Sharing on my blog’s FB page later today! I’ve yet to get my kids to try quinoa, but I think this might be the recipe to convince them! Love all the cheesy chicken-y goodness here. Pinning now! Oh yeah, for sure! I hope they love it! This looks so good!! Also that shot with the steam is on point. Nice!